Have you ever hesitated when saying in Italian the sentences “I leave home/ I leave work“? If you have ever taken an Italian language course to learn how to speak Italian, there is a good chance, that yes, you had. 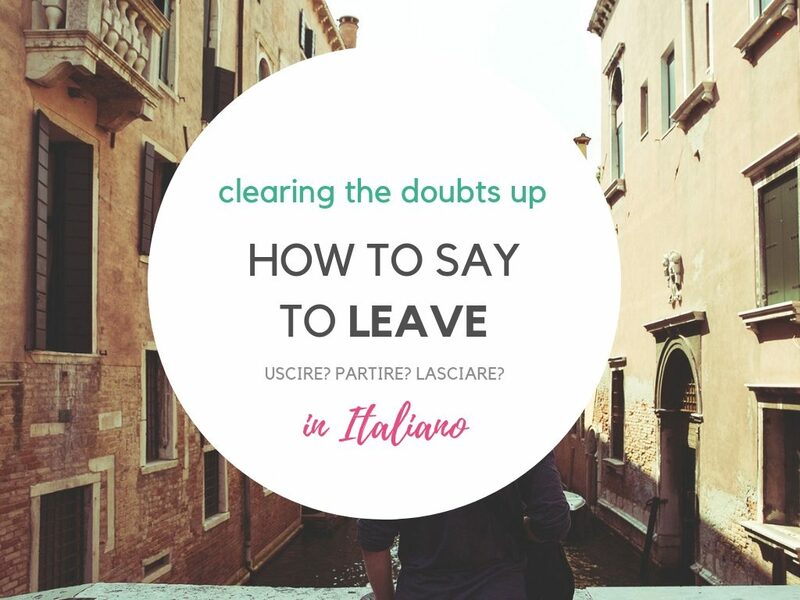 Because the verb to leave has not a straightforward translation in Italian and Italian has three different verbs meaning “to leave” in English: uscire, partire, lasciare. Back to the linguistic dilemma. How do you say leave in Italian? To leave mean “uscire” in Italian when implying the movement of physically exiting from one place. Uscire is just the opposite of entrare (to enter). You can “uscire” a house, a room or your office. Esco dall’ufficio alle 18 – I leave the office at 6 p.m.
Uscire is used in everyday Italian with other meanings. Usciamo stasera? – Are you going out tonight? So, when shall you use partire in Italian? Another correct usage of partire comes with means of transportation. A che ora parte il treno? – What times does the train leave? Can one say“parto da casa”? Yes, but, it implies that you are taking a trip to somewhere or you are going a long way somewhere. Lasciare means to abandon a place, a person or to break up with someone. If you use lasciare speaking of place, you mean that you won’t come back to the place you left. how to say in Italian “leave me alone”? how to say in Italian “let it go”? Molto utile – come sempre. Grazie!! Ciao Ron! Grazie per la tua domanda. “Andarsene” si usa quando si vuole dare enfasi all’azione di “lasciare un posto”. Ad esempio, sei al bar con amici, si fa tardi, potresti dire “ragazzi, sono troppo stanco, me ne vado a casa”. Nelle prossime settimane scriverò un articolo in cui spiego la differenza tra andare – andare via – andarsene. Grazie per i tuoi ITALIAN PILLS ! Sono molto utile per me ! Frequento corsi di libgua italiana da anni a Vienna e a Venezia ( durante l‘estate)!